The coal in the mine would be exhausted after 15 years. The equipment would be sold for its salvage value of $250,000 at the end of 15-year period. The company uses straight line method of depreciation and does not take into account the salvage value for computing depreciation for tax purpose. The tax rate of the company is 30%. 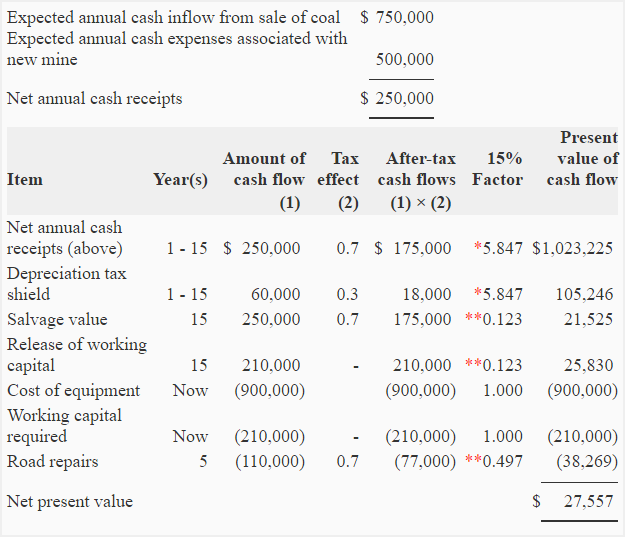 Compute net present value (NPV) of the new coal mine assuming a 15% after-tax cost of capital. On the basis of your computations in requirement 1, conclude whether the coal mine should be opened or not. **Value from “present value of $1 table”. Yes, the coal mine should be opened because its net present value (NPV) is positive. I agree with your calculation for determing NPV. However, I don’t understand why you have computed tax savings on road repiar expenses. If you are computing tax savings on it, does it imply that road repair expense is capital expenditure? My assumption is that capital expenditure qualifies for tax savings. If the answer is yes, shouldn’t road repair expense ( capital expenditure) be depreciated and used to arrive at adjusted basis to determine capital gain/loss at the time of sale ? Thank you for the examples and explanations. They were very helpful. Continue your good work. Once again and big THANK YOU. how did you get the 60,000 for depreciation?